Arrived Avalon for the Australian International Airshow. Arrived at Amberley on delivery from the US. Arrived at Williamtown on delivery from the US. Delivered to 3SQN at Luke AFB. Arrived at Williamtown. Refuelled en route by RAAF KC-30A. When A35-001 and A35-002 returned to the United States on 8 March 2017 it was not the first time that a single-engined Lockheed aircraft had flown the Pacific from west to east. Lockheed Martin's Code One magazine tells the story. Added A35-011 to 018. Table reformatted - again! Added first flight dates for A35-003 to A35-009 inclusive with thanks to Lockheed Martin, Australia. Note that some of these dates vary with previously published dates from unknown sources. A35-009 and A35-010 have arrived in Australia. Added delivery date of A35-010. Added details for A35-006 to A35-010. Reformatted table and added A35-003, 004 & 005. 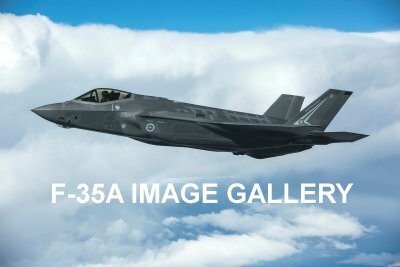 Added details of the attendance of A35-001 and A35-002 at the Avalon Airshow in MAR17. Thanks to Andy Doyle.